Bowers Kidseum in Santa Ana has a brand new exhibit Future Park Art Technology. Perfect for kids ages 2-12 it's open now and running through January 15, 2018! Immensely interactive with many cognitive benefits, it's a super fun way to spend a few hours for nurotypical children as well as kids on the autism spectrum. We had the opportunity to preview the new installation and I will say the kids loved it. Ever been to the Bowers Kidseum? Well I am partnering up with them to send one reader there to check it out for themselves so be sure to enter the ticket giveaway below. Future Park has several hands (and feet) on exhibits with not only your kids enjoyment in mind but they all serve a purpose too. We recently visited with 3 kids all on the autism spectrum ranging in ages 7, 10 and 11 and they all had a blast playing together as well as on their own! Check out the different ways your kids can learn and play within the new exhibit. By rolling the light-balls they change their color and sound. 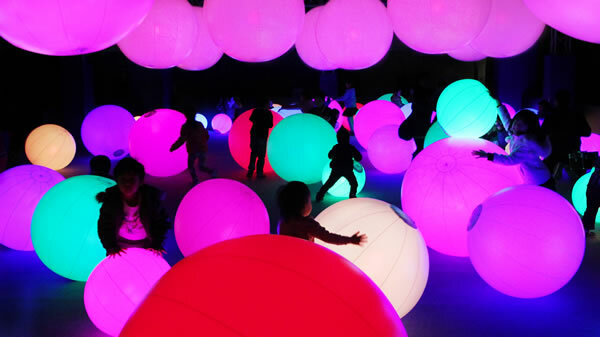 Combined, the light-balls form an orchestra. Rolling the balls in front of you will change color and release a sound. Touching the different sized balls to change the color and make music encourages spatial awareness and cooperation. Using Projected circles, triangles and squares onto the floor in vibrant colors that combine, animation, sounds and colors this exhibit will test your Childs skills of balance and matching! . As your children land on the shapes, they trigger sounds and colors. Landing on the same shapes or colors in succession create ever more beautiful colors and sounds. Children use their entire bodies to play, and more advanced children can change the space in an instant by anding connections between shapes and colors. Hopscotch for Geniuses thus is training for children’s minds and bodies helping with their sense of balance, pattern recognition and the ability to test hypothesis by themselves. Cars and trains run along digitally projected roads and railroad tracks that are connected by physical wooden blocks. As children place different blocks on the table, more cars and trains appear, forming a townscape. Children play by placing the blocks in different positions to create a town collaboratively with other children aiding their skills in pattern recognition, spatial awareness, logical thinking, creativity, power of expression as well as team work! This exhibit is a projected town that grows and evolves according to the pictures drawn by children that are then scanned and become 3-D. Cars, buildings, UFOs, and spaceships enter the virtual 3-D townscape where children can then physically interact with them by touch. Every component of the town has a role to play and be sure to watch fro the dragon that appears, many of the vehicles can help chase him off by a touch from your child. Skills that are worked within this exhibit are Creativity, power of expression, respect for diversity, interest in technology and spatial awareness. Along with Sketch Town is a craft that is made from your Childs picture by turning it into a 3-D object. This activity involves problem solving skills and logical thinking, as children have to identify where to cut, fold, and glue to create the 3-D model helping them with problem solving skill, spatial awareness and understanding of spatial perspective. We have visited Kidseum one time before and what I really appreciate about it is the the different crafts and activities they offer within the cozy space you won't loose sight of your children in. Apart form th Future Park exhibit they also offer other fun things to do. From reading nooks to a craft room to a kick back area to sit and watch fun videos there is something for everyone. The puppet theatre and drums were also a big hit with the kids. They also have a green screen area that transports your kids around the world. This is always a hit with my girl, perfect for practicing pretend play. Thanks to the generosity of Bowers Kidseum One luck reader will win a 4- pack of tickets, enter below and good luck!